I am not an administrator, do not call for the contribution of all the solutions at your own risk! We are pleased to welcome you to our sports investment club official website! Our team specializes in betting in different kinds of sports and accepts deposits in trust. Taking a deep analysis in conjunction with the Method of Martengeyla we derive a general deposit guaranteed income from 30% to 160% per month and reduce the risk of your investment to 0, keeping your deposit safe. Pass a simple registration and be welcome to our club! Minimal deposit – $50 . Rendering time - from next day to 3 days. We will make your website known! 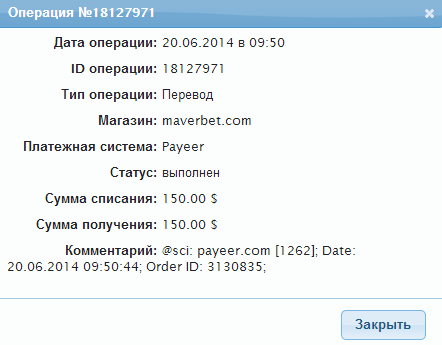 MaverBet	Received Payment 4.5 USD from account U6170033. Memo: API Payment. 13.06.14 06:48	Transfer	Sent Payment: 150.00 USD to account U6170033 from U1775***. Batch: 60210243. Memo: Shopping Cart Payment. MaverBet.com. Memo: Sent Payment 200.00 USD to account U6170033. Memo: Shopping Cart Payment. MaverBet.com. MaverBet	Received Payment 4.95 USD from account U6170033. Memo: API Payment. 06.20.14 08:48	Account	Receive	+21.9	Received Payment 21.9 USD from account U6170033 to account U1775***. Batch: 60888980. Memo: API Payment. Page generated in 0.2319 seconds with 14 queries.